September 26 (Wednesday. 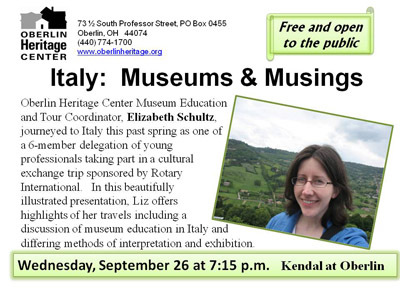 7:15 p.m.) Oberlin Heritage Center Museum Education and Tour Coordinator, Elizabeth Schultz, journeyed to Italy this past spring as one of a six-member delegation of young professionals taking part in a cultural exchange trip sponsored by Rotary International. In this beautifully illustrated presentation, Liz offers highlights of her travels including a discussion of museum education in Italy and differing methods of interpretation and exhibition. Location: Kendal at Oberlin's Heiser Auditorium.